Update: Thoughts after 21 months. Update 2: I’m very slightly amending this post to make it less informal because of a shift in readership that I couldn’t have anticipated. It’s not because of this kind of garbage, although feel free to read what they quoted to see what sort of friend-oriented flippant sentences were here before. Yep, I bought a new instrument. Here’s a little bit of backstory, some pictures, and my thoughts. I’ve had a Technics SX-PR303 since 1995 and I still love it. Weighted touch sensitive keys, sounds galore, easy multi-track recording – I’ve used and abused the thing. It’s gone with me to gigs in Virginia Beach, in and out of several apartments in Richmond, and in both of my apartments here in Rochester. It’s dealt with me playing crappy musical numbers, singing while playing, and shoddily realizing figured bass without a word of judgment. But finally, the time had come to replace it. The damper pedal was going in and out and I just couldn’t do the level of practicing that I needed to do on it anymore. In November, Vivian sent me this Slate article on this “digital hybrid” piano that Yamaha was touting. Besides the fact that it name-checked Donald in Mathmagic Land (a nice memory from grade school math class) and compared the Tactile Response System to an N64 Rumble Pak, I found myself thinking, “why haven’t all digital pianos been like this before?” Maybe it’s gimmicky, and anything with marketing speak is sure to sound that way, but it seemed sensible to me. Fast forward to the Eastman Wind Ensemble’s performance at the Midwest Clinic in Chicago. 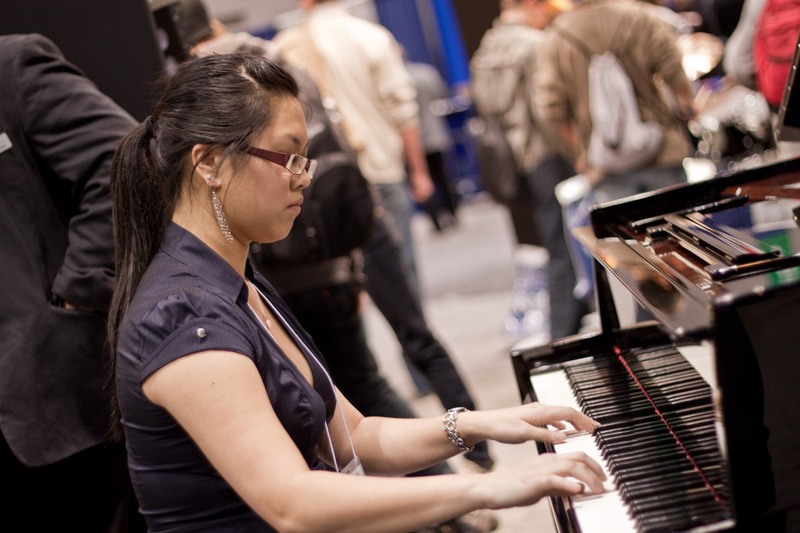 I was fortunate enough to get to go along as a performer in the ensemble, photographer, and student-wrangler (more on that in another post), and lo and behold, there was a Yamaha AvantGrand N3 in the exhibit hall. Admittedly, it was very difficult to hear in that crowded conference room, with everybody else trying all sorts of band instruments, but I fell in love. I dragged everybody over to try it out, and started thinking about how I could justify buying a new digital instrument. I’ve been doing quite a bit of practicing on it, as I have committed myself to a very musical semester. I’ve been working on: Brahms – E-Flat Clarinet Sonata (finally), Bruch – 8 Pieces for Clarinet, Viola/Cello, and Piano, Schwantner – Percussion Concerto (2 piano reduction), Bach-Busoni – Chaconne, John Adams – Chairman Dances, and a whole host of church music and other smaller things. Basically, I’ve really gotten a feel for this piano and how it helps me learn all sorts of styles of music, in addition to just how great it feels to be able to just practice when the mood strikes and be able to do more last minute learning (happens a lot in church). I wouldn’t call it an acoustic piano killer, but I think it has great potential as a practice instrument and even in places like churches where extended techniques aren’t necessary on the piano. Sadly, I won’t be playing Berg’s Vier Stücke on this thing. Finally, my (former) professor, Dr. Jean Barr, came over for coffee and a little piano playing a few weeks ago and was very impressed by the touch, feel, and pedaling. I don’t expect it to be a performance instrument, but the blessing of my professor was enough for me. While you don’t get the unique feel of a harpsichord just by changing to its sound (nor would I expect to, digital harpsichords exist as separate entities), the sound is actually eerily accurate, down to the release twang. Some notes seem suspect in terms of tuning and can’t be individually changed (as far as I know). This is probably just the effect of equal temperament, what one is accustomed to individually, and not having true sympathetic resonance. I would like to send you a Yamaha Avant Grand Jacket. If you can send me your shipping address, I will make it happen. Of course, your jacket size will be useful too. Could I please have your email address so that I can contact you regading the avant grand n3? Congratulations for this very detailed review. I am a pianist (amateur) and I have accoustic Feurich upright piano equiped with a silent. Unfortunately, due to family considerations, I must use the silent piano more often than the acoustic piano. I have two sorts of concerns with my piano and I am currently considering buying the N3. I have not tested it so far, but I plan to do so. First, the tactile reponse is different and the sensation on fingers is also different even if the Renner mecanics is being used in both cases (acoustic and numeric silent). Has this issue been resolved on the AvantGrand N3? In other words, would you feel a difference for your fingers when you play on your N3 and when you play on an acoustic grand piano. Second, my current silent mecanism is noisy (as it is on all acoustic pianos equiped with silent) i.e someone located in another room will hear the silent mecanism noise(hammers movement). When you play on your N3 (with head phones), do you have this problem or is it really silent? Helen, I ordered my AvantGrand recently and am expecting delivery within a few days. I’ve been using a GranTouch 1 for ten years or so which was the predecessor of the AvantGrand. I have played two different N3’s (the ‘grand’ version) and take issue with your first two ‘Cons’. I don’t doubt there are issues with some of the samples. There are 2 three note samples in the GranTouch that are out of tune with themselves but only when the sustain pedal is used. If you state there ‘suspect’ notes, I feel you are obligated to state which ones. When I discovered those 2 three note samples I wrote Yamaha and was put in touch with a tech in Germany. Nothing came from that but at the very least there was a formal complaint on paper. My GranTouch only has 30 note polyphony and I have ___never___ noticed any notes dropping out because I reached the ‘limit’ . I’m really curious how you can manage to come remotely close to reaching the ‘max’. Unless you are playing all 88 notes at once using a two by four, I have no idea how you can come remotely close to the ‘max. At any rate, I’m looking forward to my new purchase and am sure I will discover little glitches in their sampling set. I appreciate your review of the N3. I had considered purchasing earlier in the year. However I bought the Roland V piano and I am completely satisified with the instrument. I experiment with the voicing parameters and hammers and the instrument I can create is spectacular. I feed an audio signal of various recorded Bosendorfers and Steinways into an auxillary input and I compare and adjust my instrument to match. The similarity is incredible. I have setup an instruments with harder hammers and less soundboard resonance for Mozart pieces and the playing enjoyment is unsurpassed. My project is to build a piano case closely matching the dimensions of the N3, with optimal speakers and subwoofer installed inside the case. I think the bottom ‘A’ on the keyboard is 27.5 Hz and I am not sure if the N3 speaker system accommodates this frequency. I will ensure I have the entire frequency range covered. Wow, I hadn’t realized that strangers would come across this and comment! I suppose I should have thought that through. Jean-Marie: the instrument itself is not acoustic but all-digital, so the feeling does not change between speakers and headphones. It feels very very much like the Yamaha acoustic grand we have at my father’s house. Because there are hammers and an action, there is some noise even in “silent” mode, and if the tactile response system (vibrations) is operating, some pitch will also be heard. However, I’ve found it to be minimal and don’t think it would bother somebody in the next room. Overall, I think the N3 is by far the best option for somebody who needs quiet with the feel of an acoustic grand. Dave: As this is my personal blog, I don’t feel obligated to take the time to sit and identify which notes bother me, but I will stand by my statement. It is nothing horrible, just the occasional hearing of something not quite “in tune.” Then again, a piano is never truly in tune and even within equal temperament there are variations, so it could just be an issue of what I am accustomed to and what their samples are. As far as the max polyphony goes, I could be very mistaken about this, but my understanding is that the polyphony includes the rendering of resonance (including vibration) and partials, with the sustain pedal both up and down, so there are many voices going at once. What happens to me is that sometimes I will be making quick pedal changes and playing large, full chords and some notes will be missing following the first chord. I trust my playing, and it only happens with the loud full chords with pedal (more resonance and partials), so the only explanation I can think of is the max polyphony. Graham: I am not familiar with the Roland V, but I took a quick look. It looks very interesting and great for experimentation and flexibility. I personally needed an all-in-one solution and barely have enough time to learn my music, so something that requires customization and external speakers is out of the question. The speakers on the N3 do just fine with the bottom octave and the tactile response makes it very realistic; however, as is the case with acoustic Yamahas, it is not a particularly beautiful sound. I recently bought a N2 which I love but I’m having a hard time figuring out the best headphones to use with it. I can’t seem to find the right adapters so that I can use my existing wired mp3 player headphones so I’m thinking I need to buy a new wireless set. What kind are you using if you don’t mind me asking? I do have a set of adapters but maybe they’re just too worn out, they don’t fit snugly and loosen too easily, so maybe I just need to buy a new set. ■geekgrrl, May be you should try the new Shure 940 ! (coming soon) There are some hopefull reviews. @Dave – I can confirm that sometimes 256 voices isn’t enough and you get drop-outs. It rarely happens, but it does. If you can live with that, the N3 is a perfect alternative to a real grand piano. @Graham Glad you like the Roland V. I’ve also tried this piano but in my opinion it doesn’t even come close to the N3. There is a huge difference in the action (for example the V has plastic keys) and sound. That’s as good as it gets the Roland V-grand has a plastic Digital piano action that feels like a Fatar keyboard but cost Twenty thousand dollars. I noticed in the third photo of your new N3 that you seem to have a laptop computer connected to the piano; is this for playing additional “software pianos” (like a Bosendorfer Imperial, Vintage Steinway D, etc. ), or do you use it for recording purposes? How has better piano sound? Your review is OK, though I miss a deeper understanding and clearer descriptions of the technical aspects of the instrument. How many sample layers do your hear? Is there noticable looping? Is there a good connection with the instrument, or do you experience noticable latency? Is there any flaws in the speaker and/or sample sound, any registers sound muddy or harsh? Etc..etc..
Btw. the sustain pedal ressonance effect is quite exaggerated, the lower register is too bass heavy, and there is notable looping artifacts in the lower register. This is one of the best DPs out there, but Yamaha cut too many corners on this one when you consider the asking price IMO. Just saying that your AvantGrand “feels nice” doesn’t really mean a lot. I am not a piano reviewer, and I don’t pretend to represent myself as such. This post was not meant as an official or in-depth review of any sorts – this is entirely a personal blog and the post was written in a voice that was geared more toward the audience of my blog at the time – friends and family. A fair bit of time has since elapsed and I would probably have written this differently today, given audience changes and other factors, but I will not change what I originally wrote just to appease a few fans (fanatics?) who are coming across a years-old blog post and taking it upon themselves to find everything that is wrong with me and what I wrote. This is my first digital piano (I assume that my previous keyboard is not classified the same way, although I don’t really know) and I grew up learning on an old upright and then a Yamaha C3, so I have nothing to compare it to in its own class. It sounds pretty much like a Yamaha concert grand does – bright-ish, bass-heavy, a little tinkly/tinny on top. Since it’s sampled from a Yamaha, that didn’t seem to need clarification at the time and I still don’t think it does. Nothing is muddy or latent by my standards, but the practice pianos at Eastman lowered my standard for practice instruments quite a bit. The pedal does sound artificial in quite a few conditions, because it is. The speakers are fine, although one of the covers on the bottom has been buzzing/rattling as of recently, so I’ve removed it for now. There are plenty of aspects in which it does not perfectly replicate a real piano and I don’t expect it to. It does the job – allows me to practice at home (which at the time was a noise-controlled environment), moves easily between environments (we are still in the moving-often-to-far-spread-places phase of life), does not require me to regularly maintain it, and offers enough realism for me to be able to transition to playing/performing on a “regular” acoustic piano without any more adjustment than would be necessary coming from any other instrument. Please understand that I am a graduate-degree-holding, conservatory-trained classical pianist. I am actually quite picky about traditional pianos, although I pride myself on being able to make anything work, because you cannot always be in control of what you are performing on. I may not be a digital piano connoisseur, and I don’t expect to be one at any point, but I do know what I like in a piano and how to focus on what helps me to achieve what I need/want to accomplish as a musician. If you are looking for an expert digital piano review, I suggest that you look elsewhere. That said, you may also be interested in the brief (also informal and rather not detailed) follow-up post I wrote. in actual playing. For me, the sound through earphones (I use Bose), is not as good as without (seems very sharp), but mellows out if I use the soft pedal all the time when using earphones. I am just a self taught old senior, so I hope nothing I have said is too controversial. Again, thanks for your blog. Great to read this post – thanks Helen. Could you possibly write a quick update about your feelings about the piano after this additional time? I’m contemplating one and would appreciate any more data on it. Thanks! I hope I am not intruding too much on Helen’s blog, but I thought I would risk it because I have been intrigued by the promotions of the Avantgrand as being essentially equivalent to the 9 foot Yamaha concert grand. Lately I have found on Youtube, two pieces, recorded on the Yamaha concert grand, that I also practice on my Avantgrand. In comparing the two (the recording from the concert grand to my Avantgrand) I can tell a subtle difference, but the tone qualities are very hard to tell apart and I have to work at it. The concert grand has a bit more depth to the lower register, which I think would be expected, and a tad more resonance to the upper notes. When I listen to the pre-recorded pieces on the Avantgrand, played by the professionals, there is somewhat a hollow like quality to the piano. I have never played on a Yamaha acoustic piano, let alone a Yamaha concert grand (although about 50 years ago, I played briefly on a Baldwin concert grand), so I can’t comment on that. I suspect it would not be present. When it comes to classical performance, I am still a Steinway person, but I love the Avantgrand and feel it was and remains a very good investment and friend. I would definitely ignore promotions of the AvantGrand being equivalent to concert grands 🙂 It’s electric, for sure. I wouldn’t want to perform in a concert venue on it – I stand behind my evaluation of it as a very, very good practice/home instrument. I recently came across a software product by Synthogy (see http://www.synthogy.com) called Ivory II American Concert D, which reproduces the sound from the 1951 Steinway concert grand, apparently a rather famous piano. There is a demo on their web site and it sounds remarkable, and the piano being played is obviously a digital. I am wondering if using the software with the Avantgrand, via its MIDI output to a computer with the Ivory II software installed would allow the Avantgrand to end up sounding like a Steinway. I was wondering if anyone had experience with this type of thing. to the audio outlets, the higher notes and lower ones have more substance and are more enjoyable, in fact, really good. Just curious… why did you redact the price? Didn’t like the tone of it. See update 2 at the top. I did read your second update, but I’m not sure I understand. You redacted the price because you didn’t like the tone of it? I’m considering buying the N2 here in NYC and I’m trying to figure out how to get the best price. Also, I’m considering looking for it second-hand. Do you think I’ll have any luck? I’d prefer the N2. Also, if I get it and decide after awhile that is want to get rid of it or trade up, will I be able to sell it, and at a decent price? Hello Helen, Thanks for your blog. It encouraged me to get a N1 which I upgraded to an N3. Living in a 1000 sq ft San Francisco apartment made it impossible have the 7 ft Fazioli which had my dream sound and feel. While the N3 is the best piano in a size that I can accommodate, and by far the best digital available, it still sounds like a rather anemic Yamaha 7ft grand. It lacks presence, which in grands is provided mostly by their massive soundboards especially in the lower register. I connected a high end equalizer and subwoofer to the N3’s Aux out, and was able to fine tune the relative sound (depth and loudness) of each individual note below A4. I personally don’t care for the Yamaha voice, and I now have a somewhat closer approximation of the Fazioli sound profile, and presence. The bottom line is the N3 now sounds and feels more like a mid-sized grand with my preferable voice. A marked improvement over the original. This requires very little technical expertise and I would be happy to advise anyone interested. Hi Steve, is iT possible to send me the schematic overview About the connections with the equalizer? I use a N3 too and would like to equalize the voice by myself. You can equalize your N3 by Aux Out- equalizer- Aux In. I’ve tried it and I don’t recommend it. You will be prone to loud feedback if you’re not very careful. Most significant the N3 will then become stereophonic, and you will use only 1/2 it’s speakers. What makes the N3 sound better than the N1 is it’s quadraphonic, so doing this results in a sound with less presence. Hi, Steve I’m interested in the type and brands of your subwoofer and equaliser. When I use my headphones on the N3 (Sony MDH 7520) the sound of pianovoice 1 is excellent. Better than with the speaker-system. When playing by speakers I try to get the phonessound by modifying the keyboard sensitivity : Push the voice button+C7 and the TRS on 3!. The mid and higher parts sounds more open than and gives a simulation of harmonic-tones. I would like to try your solution too. I also find this interesting. As long as Helen is OK with it, please feel free to continue your discussion, however technical, right here! Sorry, I mis-typed my nickname. A factor that no one here has taken account in comparing the N3 with full size acoustic piano grand is the problems that will probably arise with in a home living room. A 7ft Fazioli (my favorite) would be too loud and require the owner to close the lid. With the muffled resulting sound, the N3 would definitely sound better. It’s highly probably that the “large” sound of the acoustic grand would produce unwanted, sometimes harsh reflected overtones from adjacent walls. The grand was made to sound it’s best in a concert hall, with an audience seated yards away. For home use this makes the whole discussion of having an N3 vs a full size grand academic. 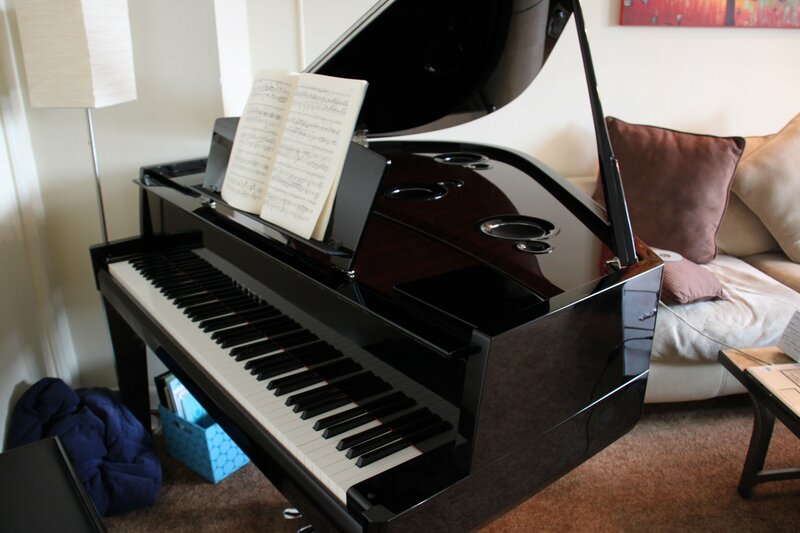 For home use the comparison should be between an N3 and a 6ft or under baby grand. My N3 hands down (no pun!) sounds better than any 5′ 6″ acoustic on the market. Hi everyone, Below is the basic info. from my post on Piano World. I tried 4 subwoofers and the last, Gallo CLS-10 was by far the best. It’s very large dynamic range made the greatest improvement in the N3’s presence. The specific equalizer is probably of lesser importance, but as noted I did have a nice improvement with the DBX2231. You have to use an equalizer or the sound of the subwoofer will be unpleasantly unbalanced to specific notes on the N3. This setup is powered by just using the on/off switch on the N3. If anyone wants to follow up and actually try this equal/sub combination I will be happy to post the exact settings on both which are critical to have them integrate with the piano. Both the equalizer and subwoofer can be returned for full refunds if you don’t like the results. I upgraded from an Avantgrand N1 to a N3 a few months ago. Here’s what I did to voice it to my satisfaction. While the N3 sound is a significant improvement over the N1, it’s lower register is still pretty wimpy compared to a Yamaha acoustic grand. The 4 resonators that power the soundboard definitely help, but the piano lacked presence, which is no surprise with a DP. I first tried to use my old equalizer with subwoofer through the Aux-out/Aux-in as I had done with good results on my N1. But since the N3 is a quadraphonic sound and the equalizer/sub is in stereo, the resulting sound was more balanced but it was in stereo and had less depth. I then tried using the eq/sub with the Aux-out only (just adding sound to the N3 not actively modifying it) and the results were much better. I then upgraded to a DBX 2231 equalizer controlling a Gallo 10″ subwoofer and the results were spectacular. The DBX has a noise reduction filter that gives the subwoofer a smoother tone that I really like as it reduced the N3’s Yamaha slightly over-bright sound. (I went from a DBX215s with a Yamaha 8″ sub.) The Gallo subwoofer has a frequency range of 19Hz to almost 1KHz with the low pass filter turned off, so I’m able to get the undertone range extended from the lowest note on the N3 up through the first octave above middle C. This also mitigated the Yamaha brightness. I use the sub sparingly and fine tune it with the equalizer so it blends in with the non-electronic tone of the N3 keys. The largest speakers (there are 12) on the N3 are four 6 1/2″ woofers so the 10″ sub adds a much needed range. 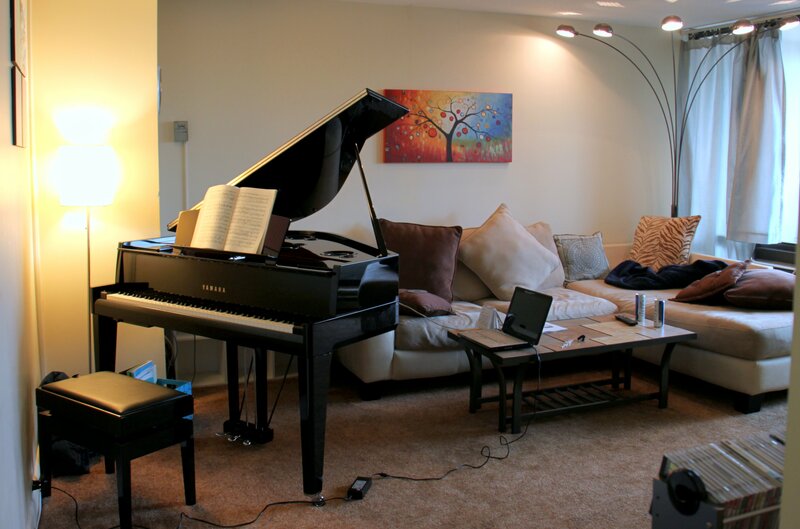 I am a classical pianist in an apartment with a small living room. I certainly know I’d get a sound more to my liking with many 7ft (or even some 6ft) acoustic grands, but their size would be too large for the room. The N3 sounds very good now, and I have the added benefit of being able to voice it exactly to my specific preference. Steve: This is fantastic information. I am considering this EQ/Sub combo and would very much like to know your exact settings so that I can reproduce your results. Where can you find a replacement power cord or the N3? Dear Helen, very nice text. I am happy owner of an N3, and what I like on it is the connection between player and instrument. 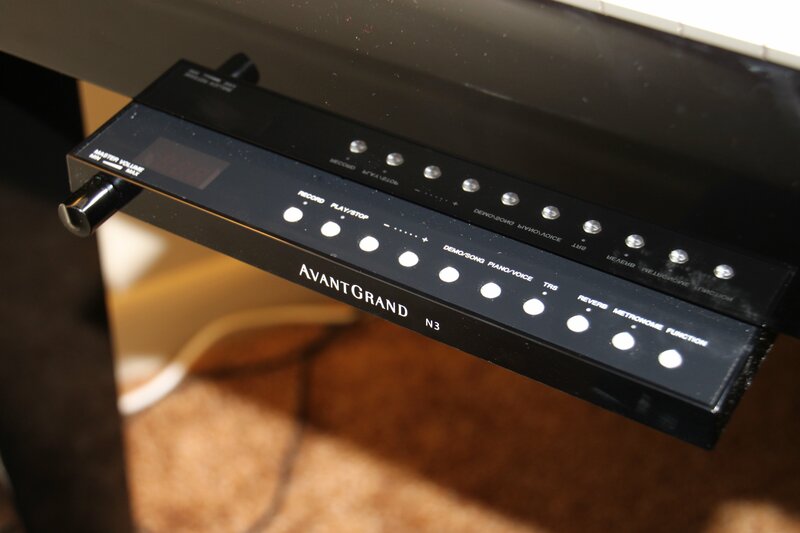 I am not a fan of Yamaha sound with exceptions, but Avant Grand is amazing and still unbeatable digital instrument for practice and home music.